Dectin-1, a C-type lectin recognizing fungal and mycobacterial pathogens, can deliver intracellular signals that activate dendritic cells (DCs), resulting in initiation of immune responses and expansion of Th17 CD4+ T cell responses. In this paper, we studied the roles of human Dectin-1 (hDectin-1) expressed on DCs in the induction and activation of Ag-specific CD8+ T cell responses. We first generated an agonistic anti–hDectin-1 mAb, which recognizes the hDectin-1 Glu143-Ile162 region. It bound to in vitro monocyte-derived DCs and to in vivo CD1c+CD1a+ dermal DCs but not to epidermal Langerhans cells. Anti–hDectin-1–mediated DC activation resulted in upregulation of costimulatory molecules and secretion of multiple cytokines and chemokines in a Syk-dependent manner. DCs activated with the anti–hDectin-1 mAb could significantly enhance both neo and foreign Ag-specific CD8+ T cell responses by promoting both the expansion of CD8+ T cells and their functional activities. We further demonstrated that delivering Ags to DCs via hDectin-1 using anti–hDectin-1-Ag conjugates resulted in potent Ag-specific CD8+ T cell responses. Thus, hDectin-1 expressed on DCs can contribute to the induction and activation of cellular immunity against intracellular pathogens, such as mycobacteria, that are recognized by DCs via Dectin-1. Vaccines based on delivering Ags to DCs with an agonistic anti–hDectin-1 mAb could elicit CD8+ T cell-mediated immunity. Dendritic cells (DCs) can initiate and control immune responses. DCs express TLRs and C-type lectins, which are crucial for sensing and initiating immune responses against pathogens (1–7). Dectin-1, a C-type lectin receptor, is highly expressed on DCs (3, 8). It can recognize both fungal and mycobacterial pathogens. It also delivers intracellular signals to activate DCs, resulting in initiation of immune responses to those pathogens (3, 9, 10). Upon recognition of fungal β-glucans, the tyrosine residue within the cytoplasmic ITAM is phosphorylated (11, 12), followed by recruitment of Syk and Card9 (13–16). These sequential events lead to activation of NFAT (17), MAPK (18), and NF-κB (12, 13, 19, 20). This results in secretion of multiple cytokines (3), including IL-10, IL-6, TNF-α, and IL-23 (14, 19), that can directly impact the quantity and quality of Ag-specific adaptive immune responses. Most notably, Dectin-1–mediated DC activation contributes to the expansion of Th17 responses (3, 14, 21, 22). In line with this, human memory T cell responses to Candida albicans are predominantly Th17 (13, 14) and, to a far lesser extent, Th1 (23, 24). Soluble factors, including IL-6 and IL-1β, secreted by APCs promote the expansion of Th17 responses (13, 14, 25), which are crucial for mounting protective immunity to intracellular bacterial pathogens, such as mycobacteria (26) and Francisella tularensis (27). Dectin-1 contains a putative internalization signal sequence for the lysosomal endosome (28, 29) and thus can contribute to pathogen-specific T cell responses. Mouse DCs that take up Ags via Dectin-1 can present antigenic peptides to both CD4+ and CD8+ T cells (21, 22). One recent study showed that OVA-transgenic mice immunized with conjugates of anti–Dectin-1 and OVA generated strong CD4+ T cell responses but weak CD8+ T cell responses (22). However, a more recent study (30) showed that mouse DCs activated with β-glucans could prime cytotoxic CD8+ T cell responses. These studies (21, 22) suggested that Ags delivered to DCs via Dectin-1 could result in potent Ag-specific CD8+ T cell responses when DCs were activated by signaling via Dectin-1. Thus, we hypothesized that Ags delivered to DCs via human (h)Dectin-1 with a concomitant activation of the DCs via the same hDectin-1 might result in potent Ag-specific CD8+ T cell responses. This hypothesis was tested using an agonistic anti–hDectin-1 mAb and anti–hDectin-1 mAb-Ag (neo and foreign Ags) conjugates. Our data showed that DCs activated with anti–hDectin-1 mAb resulted in enhanced CD8+ T cell responses. We further demonstrated that anti–hDectin-1 mAb and its conjugates with neo- and non–self-Ags targeted hDectin-1 expressed on DCs to elicit potent Ag-specific CD8+ T cell responses. Anti-CD1a (BD Biosciences, San Jose, CA), anti-CD1c (BioLegend, San Diego, CA), and anti-CD207 (Baylor Institute for Immunology Research, clone 15B10) Abs were used in immunofluorescence. Anti-human IgG (Fab) conjugated with alkaline phosphatase (AP) and all other Abs used for staining cells were purchased from Southern Biotechnology Associates (Birmingham, AL) and BD Biosciences, respectively. IFN-α, IL-4, and GM-CSF were purchased from the pharmacy at Baylor University Medical Center (Dallas, TX). IL-2 and CFSE were purchased from PeproTech (Rocky Hill, NJ) and Molecular Probes (Eugene, OR), respectively. Piceatannol, curdlan, and laminarin were from Sigma-Aldrich (St. Louis, MO). Escherichia coli LPS was purchased from InvivoGen (San Diego, CA). HLA*0201 tetramers of influenza viral (Flu) M158–66 and MART-126–35 (27L) were purchased from Beckman Coulter (Fullerton, CA). Flu M158–66, MART-126–35, and MART-126–35 (27L) peptides were synthesized by Biosynthesis International (Lewisville, TX). Receptor ectodomain.hIgG (human IgG1Fc) and AP (human placental AP) fusion proteins were produced for immunizing mice and screening mAbs, respectively. A mammalian vector for human Fc and AP fusion proteins was engineered, as previously described (31). Fusion proteins were produced using the FreeStyle 293 Expression System (Invitrogen, Carlsbad, CA), according to the manufacturer’s protocol. Receptor ectodomain.hIgG was purified by HiTrap protein A affinity chromatography (GE Healthcare, Piscataway, NJ). Six-week-old BALB/c mice were immunized with the receptor ectodomain.hIgGFc fusion protein with Ribi adjuvant and then boosted. Three to four days after a final boosting, mouse B cells were fused with SP2/O-Ag 14 cells. Hybridoma supernatants were screened, as described previously (31). Positive wells were then screened in FACS using 293F cells transiently transfected with expression plasmids encoding full-length hDectin-1 cDNAs. Selected hybridomas were single cell cloned and expanded in CELLine flasks (Integra, El Segundo, CA). mAbs were purified by HPLC using MabSelect resin (GE Healthcare). Mock, 293F cells, and 293F cells transfected with full length of hDectin-1 were stained with different concentrations of Alexa Fluor 488-labeled anti–hDectin-1 or control mAbs. Anti–hDectin-1 mAb was also titrated by ELISA using plates coated with 2 μg/ml recombinant hDectin-1-Fc (BIIR) or hIgG-Fc (BIIR). Goat anti-human IgG (Fab)-HRP (Jackson ImmunoResearch Laboratories, West Grove, PA) was used as detection Ab. Epitopes of anti–hDectin-1 mAb were characterized by ELISA using polyethylene pins attached with 15-mer peptides overlapping 11 aa (Mimotopes, San Diego, CA). Experiments were performed as per the manufacturer’s protocol. We tested whether β-glucans could inhibit the binding of anti–hDectin-1 mAb to hDectin-1. A total of 100 μg/ml soluble curdlan or 10 mg/ml laminarin were preincubated in plates coated with hDectin-1 for 20 min, and then different concentrations of anti–hDectin-1 mAb were added into the plates. Anti–hDectin-1 mAb was detected by anti-human IgG (Fab)-HRP in ELISA. Human abdominal skins were obtained from healthy donors who underwent cosmetic surgeries at Baylor University Medical Center, according to Institutional Review Board guidelines. Cryosections were fixed in cold acetone, dried, and blocked for nonspecific fluorescence with Fc Receptor Block and Background Buster (Innovex Biosciences, Richmond, CA). Sections were then incubated in either anti–hDectin-1 or isotype Abs labeled with Alexa Fluor 568 (Molecular Probes). Sections were blocked with mouse serum and incubated in anti–CD1c-Alexa Fluor 647, anti–CD1a-FITC, and anti–CD207-Alexa Fluor 488, then subsequently stained with DAPI (Molecular Probes). Digital images were taken using an Olympus BX51 with a PlanApo (Solms, Germany) 20/0.7 or PlanApo 40/0.95 objective, a Roper Coolsnap HQ camera, and Metamorph software (Molecular Devices, Sunnyvale, CA). Confocal images were acquired using the Leica SP1 (Leica, Solms, Germany) and PlanApo 63/1.32 objective. PBMCs of HLA-A*0201 healthy volunteers were fractionated by elutriation, according to Institutional Review Board guidelines. IL-4DCs and IFNDCs were prepared from monocytes, as described previously (32). Total CD8+ T cells were purified using enrichment kits (StemCell Technologies, Vancouver, British Columbia, Canada). Naive CD8+ T cells (CD45RA+CD45RO−) (purity > 99.2%) were purified by FACSAria (BD Biosciences). For DC activation, 1–2 × 105 DCs/well in RPMI 1640 medium (Life Technologies, Rockville, MD) containing 10% human AB serum (GemCell, CA), penicillin/streptomycin (Life Technologies), HEPES (Life Technologies), sodium pyruvate (Sigma-Aldrich), and glutamate (Sigma-Aldrich) were cultured in 96-well plates with anti–hDectin-1 or control IgG mAbs (10 μg/ml) for 18 h. DCs were stained with the Abs indicated, and the expression levels of costimulatory molecules were measured by flow cytometry (FACSCalibur; BD Biosciences). A total of 40 μg/ml piceatannol, 100 ng/ml E. coli LPS, or 100 μg/ml curdlan were added into the cultures indicated. For the experiments testing DC activation by combinations of anti–hDectin-1 mAb and LPS, 1 ng/ml LPS from E. coli was used. This concentration of LPS was determined by measuring cytokines and chemokines secreted from DCs cultured with different concentrations of LPS in the presence or absence of 10 μg/ml anti–hDectin-1 mAb. Culture supernatants were quantitated for IL-6, IL-10, IL-12p40, TNF-α, IL-1β, and MCP-1 using the BeadLyte cytokine assay kit (Upstate Biotechnology, Lake Placid, NY) as per the manufacturer’s protocol. A total of 5 × 103 IFNDCs were cocultured with 1–2 × 105 CD8+ T cells for 8–10 d in the presence of IL-2 (20 U/ml). DCs were loaded with recombinant proteins or peptides, as indicated, for at least 6 h, and then washed twice. On day 8 or 10, cells were stained with anti-CD8, anti-granzyme B, anti-perforin Abs, and tetramers. Five-hour 51Cr release assays were performed using T2 cells loaded with different concentrations of peptides (Flu M158–66 and MART-126–35) (33). The cytotoxicity of MART-1–specific CD8+ T cells was also measured using cell lines (Mel290 and K562) that were grown in RPMI 1640 medium containing 10% FCS (Gemini Bio-Product, West Sacramento, CA), penicillin/streptomycin, HEPES, sodium pyruvate, and glutamate. A chimeric anti–hDectin-1 mAb containing IgG4 H chain with two site mutations (S228P and L235E) was generated (34). The presence of the two mutations abrogated residual nonspecific binding capacity of mAbs to Fc receptors (34). cDNA from total RNA was synthesized using a SMART RACE kit (BD Biosciences) and amplified with universal 5′ primers and isotype-specific 3′ primers (mIgGκ, 5′-ggatggtgggaagatggatacagttggtgcagcatc-3′ and mIgG2a for mAb clone 15E2, 5′-ctggacagggatccagagttccaggtcaaggtcactggc-3′ (Operon Biotechnologies, CA). PCR products were then cloned (pCR2.1 TA kit; Invitrogen) and characterized by DNA sequencing (MC Lab, South San Francisco, CA). Using the derived sequences for the mouse H and L chain V regions, gene-specific primers were designed with flanking restriction sites (BglII and ApaI for HV and NheI and XhoI for LV) and used to PCR amplify the entire V regions for cloning into expression vectors that were previously engineered to encode constant regions of human IgGκ (aa 106–214 of BC095489) or IgG4 H (aa 126–445 of AAH25985) flanked with XhoI and NotI or ApaI and NotI, respectively. For the L chains, the end of the coding sequence was followed immediately by the stop codon/NotI site, whereas for the H chain, an NheI site was inserted before the stop codon/NotI site to facilitate fusion of an Ag cassette that contains SpeI at the 5′ end and a stop codon-NotI at the 3′ end. The control human IgGκ sequence corresponds to gi|49257887| residues 26–85 and gi|21669402| residues 67–709. The control human IgG4 H vector encodes for the full-length protein of AAH25985 with S228P and L235E substitutions (34). Mammalian cell vectors directing the secretion of chimeric mouse anti–hDectin-1 mAb variable regions fused to human IgG4 H and L chain constant regions were engineered with unique NheI–NotI sites at the H chain C terminus. Clostridium thermocellum dockerin (Doc) and cohesin (Coh) coding sequences were cloned in frame with the H chain C terminus, as were several Ag-coding sequences. Recombinant proteins were produced using the FreeStyle 293 Expression System (Invitrogen), according to the manufacturer’s protocol. Culture supernatants were purified via protein A affinity chromatography. Coh-Ag fusion proteins (Coh-Flu M1 and Coh-MART-126–35 [27L]) were also expressed using the system described above but were purified via Q Sepharose chromatography, followed by Ni2+ chelating chromatography. Endotoxin levels were <0.2 U/ml. Recombinant mAb-Ag conjugates were formed by mixing mAb.Doc fusion proteins with 2 molar equivalents of Coh.Ag fusion proteins in PBS 1× with Ca2+ and Mg2+ (Biosources). The Doc and Coh domains self-associate to form a stable and specific complex. Statistical significance of the difference between experimental variables was determined using the Student t test, and significance was set at p < 0.05. Anti–hDectin-1 mAb were generated in this study. The specificity of anti–hDectin-1 mAb (clone 15E2 [IgG2aκ]) was tested by staining 293F cells transfected with a full-length hDectin-1 expression vector (Fig. 1A). It did not stain 293F cells transfected with human DC-specific intracellular adhesion molecule-3 grabbing nonintegrin, DEC-205, Lectin-like oxidized low-density lipoprotein receptor-1, or ITIM-containing DC immunoreceptor (data not shown). The binding capacity of anti–hDectin-1 (clone 15E2) was further demonstrated by staining hDectin-1 transfectants with different concentrations of anti–hDectin-1 (15E2) versus isotype control mAb (Fig. 1B). Anti–hDectin-1 mAb (15E2) recognized hDectin-1-Fc but not IgG-Fc (Fig. 1C). Characterization of anti–hDectin-1 mAb. A, 293F-hDectin-1 transfectants and 293F cells were stained with 1 μg/ml Alexa Fluor 488-labeled anti–hDectin-1 mAb (15E2) or isotype control mAb. B, 293F-hDectin-1 transfectants were stained with different concentrations of FITC-labeled anti–hDectin-1 (15E2) or isotype control mAbs. C, Binding capacity of anti–hDectin-1 mAb to soluble hDectin-1 molecules. ELISA was performed in the plates coated with soluble recombinant hDectin-1-Fc or control Fc. D, Epitopes for anti–hDectin-1 mAbs (15E2) were characterized by ELISA using gear-bound peptides (15-mer overlapping by 11 aa). E, Amino acid sequence of hDectin-1: transmembrane domain (gray), epitopes of clone 15E2 (red), and a putative β-glucan binding sites (blue). F, Binding capacity of anti–hDectin-1 mAb to soluble hDectin-1 molecules in the presence of 100 μg/ml curdlan or 10 mg/ml laminarin. 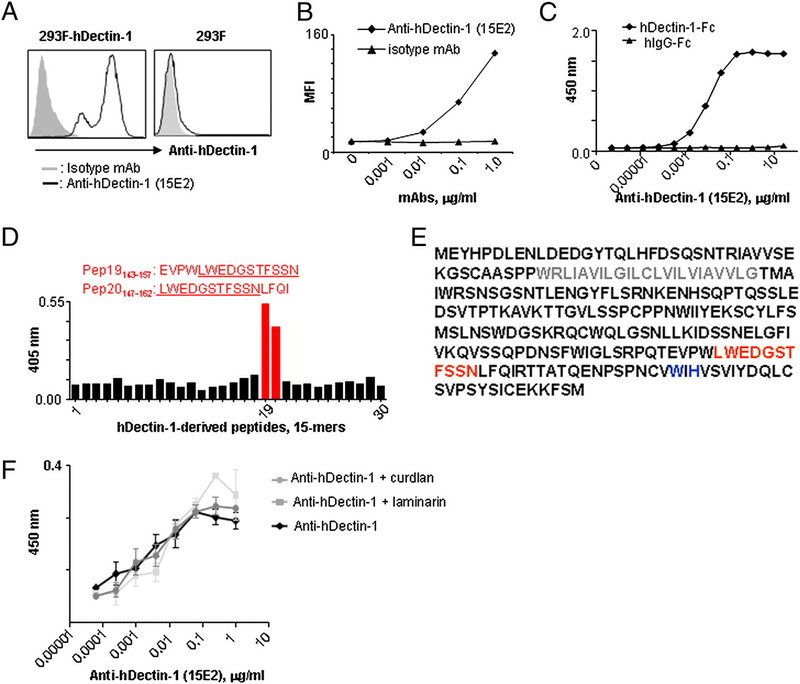 Epitopes of anti–hDectin-1 mAb were characterized by using gear-bound peptides (30 15-mer overlapping by 11 aa) derived from the ectodomain of hDectin-1. Fig. 1D shows that the anti–hDectin-1 recognized two overlapping peptides, pep19143–157 and pep20147–162, that are located within the lectin domain of hDectin-1 mAb (Fig. 1E) but do not overlap with the putative β-glucan binding site (Trp221/His223) (35, 36). Neither curdlan nor laminarin did inhibit the binding of anti–hDectin-1 mAb (15E2) to hDectin-1 molecules (Fig. 1F). PBMCs from healthy donors were stained with anti–hDectin-1 mAb (clone 15E2) and Abs specific for cell surface markers. Fig. 2A shows that myeloid DCs (mDCs) (Lin−CD123−HLA-DR+CD11c+), CD14+ monocytes, and CD19+ B cells (but not CD3+ cells) expressed Dectin-1. In vitro monocyte-derived IL-4DCs and IFNDCs (32) also expressed Dectin-1 (Fig. 2B). Blood mDCs, in vitro monocyte-derived DCs, and skin dermal DCs, but not LCs, express Dectin-1. A, PBMCs from healthy donors were stained with 1 μg/ml FITC-labeled anti–hDectin-1 mAb (15E2) and Abs specific for cell surface markers. mDCs were gated on Lin−CD123−HLA-DR+CD11c+ cells. B, IL-4DCs and IFNDCs were stained with 1 μg/ml FITC-labeled anti–hDectin-1 mAb. C, Frozen skin sections were stained with anti-Langerin, anti-CD1c, and anti–hDectin-1 mAb. D, Skin sections were stained with anti-CD1a, anti-CD1c, and anti–hDectin-1 mAb. Confocal images (original magnification ×40) were acquired with the Leica SP1 and Planapo63/1.32 objective. We next tested the expression levels of Dectin-1 on human skin DC subsets by immunofluorescent staining. Human abdominal skin sections from healthy donors who underwent cosmetic surgeries were stained with anti–hDectin-1 mAb, anti-CD1c, and anti-Langerin mAbs. Fig. 2C shows that anti–hDectin-1 mAb mainly bound to CD1c+ dermal cells but not to Langerin+ epidermal Langerhans cells (LCs). To further characterize Dectin-1–expressing cells in the skin, sections were stained with combinations of anti–hDectin-1, anti-CD1c, and anti-CD1a mAbs. Fig. 2D demonstrates that CD1a+ cells only in the dermis, but not the epidermis, express Dectin-1. Tissue sections were also stained with DAPI and isotype control Abs (Supplemental Fig. 1). Thus, we conclude that dermal CD1c+ DCs and CD1a+ DCs, but not epidermal LCs, express significant levels of Dectin-1. 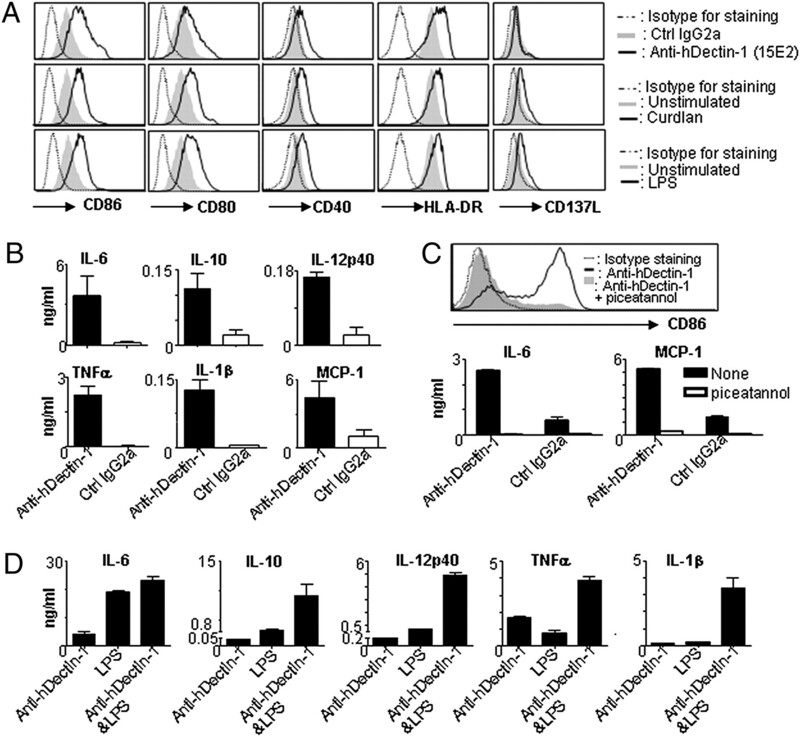 Monocyte-derived IL-4DCs cultured with anti–hDectin-1 mAb (15E2) expressed increased levels of costimulatory molecules, CD86, CD80, and CD40, and HLA-DR (Fig. 3A, upper panels). Similar expression levels of these costimulatory molecules were observed on IL-4DCs stimulated with curdlan and LPS from E. coli (Fig. 3A, middle and lower panels). CD137L expression was upregulated by both curdlan and LPS but not anti–hDectin-1 mAb. Anti–hDectin-1 mAb (15E2) activates monocyte-derived IL-4DCs. A, IL-4DCs were stimulated with 10 μg/ml anti–hDectin-1 mAb or isotype-matched control mAb overnight (upper panel). IL-4DCs were also cultured in the presence of 100 μg/ml curdlan (middle panel) and 100 ng/ml E. coli LPS (lower panel). DCs were stained for CD86, CD80, CD40, HLA-DR, and CD137L. Three independent experiments using cells from different healthy donors gave similar results. B, Cytokines and chemokines in the culture supernatants were measured by Luminex. Error bars are SD of triplicates in three independent experiments. C, IL-4DCs were stimulated with 10 μg/ml anti–hDectin-1 mAb overnight in the presence of piceatannol (40 μg/ml). Expression levels of CD86 and the amounts of secreted IL-6 and MCP-1 were measured. Error bars are SD of triplicates from two independent experiments using cells from four healthy donors. D, IL-4DCs were cultured overnight in the presence of 10 μg/ml anti–hDectin-1, 1 ng/ml E. coli LPS, or combination of anti–hDectin-1 and E. coli LPS. Cytokines and chemokines in the culture supernatants were measured. Error bars represent SD of triplicates from two independent experiments using cells from two healthy donors. IL-4DCs activated with anti–hDectin-1 mAb (15E2) secreted increased amounts of IL-6, IL-10, IL-12p40, IL-1β, and MCP-1 (Fig. 3B). In addition, anti–hDectin-1 mAb alone could induce DCs to secrete significant amount of TNF-α. DCs stimulated with curdlan, a polymer of β-glucan, produced higher levels of cytokines and chemokines than DCs activated with anti–hDectin-1 mAb. However, curdlan and anti–hDectin-1 mAb induced DCs to secrete the same cytokines and chemokines (Supplemental Fig. 2). E. coli LPS was used as a control. Curdlan induced higher levels of IL-1β and IL-6 secretion from IL-4DCs than E. coli LPS. A total of 100 μg/ml curdlan and 100 ng/ml LPS from E. coli induced DCs to secrete maximum amounts of cytokines and chemokines in dose titration experiments (data not shown). In the presence of the Syk inhibitor piceatannol, anti–hDectin-1 mAb (15E2) did not efficiently activate DCs. Fig. 3C, upper panel, presents the expression levels of CD86 on DCs stimulated with anti–hDectin-1 mAb in the presence or absence of piceatannol. Piceatannol also inhibited IL-6 and MCP-1 secretion by DCs activated with anti–hDectin-1 mAb (Fig. 3C, lower panels), suggesting that anti–hDectin-1–mediated DC activation is mainly dependent on the Syk-mediated signaling pathway (3, 12). Control IgG2a resulted in low levels of IL-6 and MCP-1 secretion, presumably through Fc receptors. This was also syk dependent. However, the activation of DCs by anti–hDectin-1 mAb was mainly through hDectin-1 expressed on DCs. Anti–hDectin-1 mAb could synergize with E. coli LPS (Fig. 3D). The optimal synergistic concentration of LPS used in this experiment (1 ng/ml) was determined by testing different concentrations of LPS with 10 μg/ml anti–hDectin-1 mAb. Combinations of anti–hDectin-1 mAb and LPS induced IL-4DCs to secrete increased levels of cytokines and chemokines, including IL-10, IL-12p40, TNF-α, and IL-1β. We next tested whether anti–hDectin-1 mAb could further activate IFNDCs that express higher levels of costimulatory molecules than IL-4DCs. Fig. 4A shows that anti–hDectin-1 mAb activated IFNDCs to upregulate the expression levels of costimulatory molecules, CD86, CD80, and CD40, and HLA-DR. IFNDCs stimulated with anti–hDectin-1 mAb also upregulated CD137L (4-1BBL), which is a T cell costimulatory molecule (37). 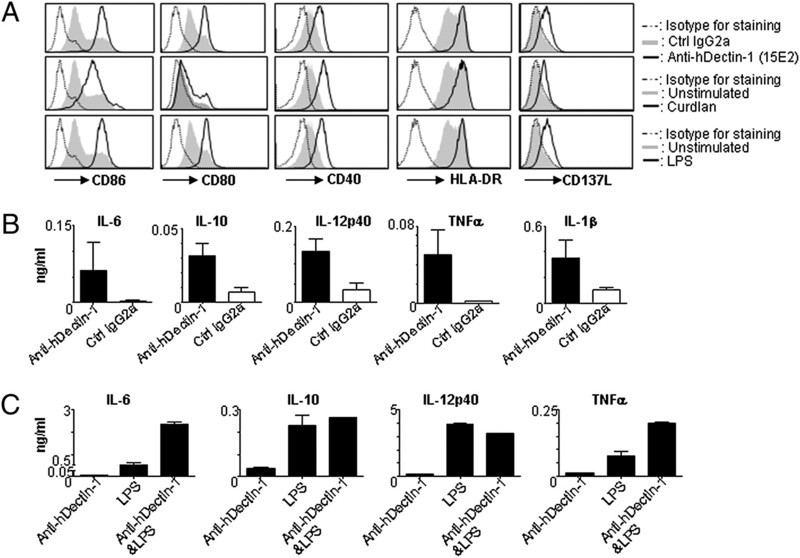 Anti–hDectin-1 mAb induced IFNDCs to secrete IL-6, IL-10, IL-12p40, TNF-α, and IL-1β (Fig. 4B). The amounts of cytokines and chemokines secreted from IFNDCs stimulated with curdlan and E. coli LPS are presented in Supplemental Fig. 3. Fig. 4C shows that combinations of anti–hDectin-1 mAb and E. coli LPS stimulated DCs to secrete increased levels of IL-6 and TNF-α but not IL-10 or IL-12p40. Combinations of anti–hDectin-1 mAb and LPS did not further enhance the expression levels of costimulatory molecules in DCs activated with either LPS or anti–hDectin-1 mAb (data not shown). Anti–hDectin-1 mAb (15E2) activates monocyte-derived IFNDCs. A, IFNDCs were stimulated with 10 μg/ml anti–hDectin-1 mAb or isotype control mAb overnight (upper panel). IFNDCs were also cultured overnight in the presence of 100 μg/ml curdlan (middle panel) or 100 ng/ml LPS from E. coli (lower panel). DCs were stained for CD86, CD80, CD40, HLA-DR, and CD137L. Three independent experiments using cells from different donors yielded similar results. B, Cytokines and chemokines in the culture supernatants. Error bars represent SD of three independent experiments with duplicate assays. C, IFNDCs were cultured overnight in the presence of 10 μg/ml anti–hDectin-1, 1 ng/ml LPS from E. coli, or a combination of anti–hDectin-1 and LPS from E. coli. Cytokines and chemokines in the culture supernatants were measured. Error bars represent SD of two independent experiments with triplicate assays using cells from two healthy donors. Taken together, anti–hDectin-1 mAb (15E2) can activate DCs in a Syk-dependent manner, resulting in the enhanced surface expression of costimulatory molecules and secretion of multiple cytokines and chemokines. Anti–hDectin-1 and E. coli LPS synergize to activate DCs. We tested whether DCs activated with anti–hDectin-1 mAb (15E2) could enhance Ag-specific CD8+ T cell responses. We used IFNDCs, which possess a potent capacity for inducing T cell responses (32). IFNDCs also express Langerin, a marker of LCs that possess a specialized function for priming CD8+ T cell responses (38). Fig. 5A shows that IFNDCs stimulated with anti–hDectin-1 mAb (15E2) were more potent than IFNDCs stimulated with control mAb in priming of MART-1–specific CD8+ T cells. Data from two independent experiments using cells from four HLA-A*0201 healthy donors are summarized in Fig. 5A, right panel. DCs activated with curdlan or anti–hDectin-1 resulted in similar levels of MART-1–specific CD8+ T cell responses (Supplemental Fig. 4). In addition to the enhanced priming of MART-1–specific CD8+ T cells, IFNDCs activated with anti–hDectin-1 mAb induced greater numbers of MART-1–specific CD8+ T cells that express granzyme B than IFNDCs stimulated with control IgG2a (Fig. 5B). Activation of IFNDCs by anti–hDectin-1 mAb also increased the numbers of tetramer+perforin+CD8+ T cells. The right panels in Fig. 5B summarize the data from six independent experiments. IFNDCs activated by anti–hDectin-1 mAb resulted in enhanced naive and memory CD8+ T cell responses. A, IFNDCs stimulated with anti–hDectin-1 mAb (15E2) or control IgG2a were loaded with 10 μM MART-126–35 (27L) peptide and then cocultured with purified naive CD8+ T cells for 10 d in the presence of IL-2 (20 U/ml). Cells were then stained with anti-CD8 and tetramer. Data from two separate experiments using cells from four healthy donors are summarized in the right panel. B, Cells from A were stained with anti-CD8 mAb and tetramer first and then with anti-granzyme B and anti-perforin Abs. 7-AAD+ cells were gated out. Data from six independent experiments using cells from different healthy donors are summarized. C, IFNDCs stimulated with anti–hDectin-1 mAb (15E2) or control IgG2a were loaded with 10 nM Flu M158–66 peptide for 2 h and then cocultured with purified autologous CD8+ T cells for 8 d in the presence of IL-2. Cells were then stained with anti-CD8 and tetramer. Data from two independent experiments with five healthy donors are summarized in the right panel. D, A 5-h 51Cr release assay was performed using T2 cells loaded with 1 and 10 nM Flu M158–66 peptide. Cells tested in Fig. 5 were from HLA-A*0201+ healthy donors. The p values were tested by Student t test. 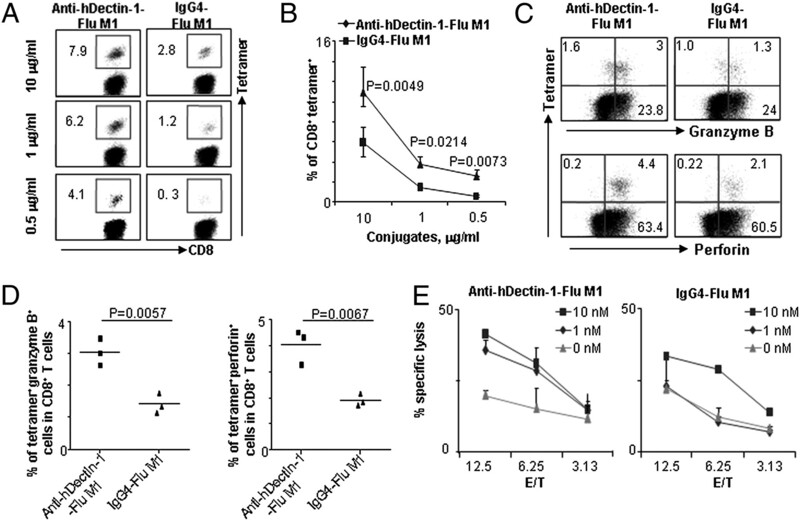 Anti–hDectin-1–mediated activation of IFNDCs also significantly enhanced Flu M158–66 peptide-specific CD8+ T cell responses (Fig. 5C). Data from two independent experiments using cells from five HLA-A*0201 healthy donors are summarized in Fig. 5C, right panel. Flu M158–66 peptide-specific CD8+ T cells elicited by IFNDCs activated with anti–hDectin-1 mAb efficiently killed target cells loaded with low concentrations of Flu M158–66 peptides (1–10 nM) (Fig. 5D). Taken together, activation of DCs via Dectin-1 with anti–hDectin-1 mAb significantly enhanced Ag-specific naive and memory CD8+ T cell responses. Conjugates of mAbs and MART-1 peptide26–35 (27L) were made by using protein–protein interaction modules from Clostridium thermocellum to link separately expressed recombinant Abs and Ags. Coh and Doc are cellulosome protein domains that interact noncovalently with high affinity and specificity (39). Anti–hDectin-1 mAb (15E2) was engineered as a chimera containing mouse V-region15 and human IgG4 Fc with two mutations (S228P and L235E) to eliminate residual low-level binding of IgG4 to Fc receptors (34). Conjugates of anti–hDectin-1 mAb and MART-1 also activated DCs to upregulate costimulatory molecules as well as cytokine and chemokine secretion from DCs (data not shown). Fig. 6A shows that IFNDCs loaded with 1 or 5 μg/ml of anti–hDectin-1-MART-126–35(27L) conjugates induced significant numbers of MART-1–specific CD8+ T cells, whereas IFNDCs loaded with the same amounts of IgG4 conjugates resulted in lower levels of MART-1–specific CD8+ T cell responses, especially at the 1 μg/ml dose. This suggests that the conjugates of anti–hDectin-1 mAb can target hDectin-1 molecules expressed on DCs, resulting in enhanced CD8+ T cell responses. Fig. 6B summarizes the data from experiments using cells from 10 HLA-A*0201 healthy donors and also shows that not all the experiments resulted in similar levels of MART-1–specific CD8+ T cell responses. Five experiments resulted in almost no or a little expansion of MART-1–specific CD8+ T cells, even when DCs were loaded with 5 μg/ml anti–hDectin-1-MART-1 conjugates. This might be related either to the expression levels of hDectin-1 on DCs, to the frequency of MART-1–specific CD8+ T cell precursors, or to the intrinsic proliferative and effector function of MART-1–specific CD8+ T cells. IFNDCs loaded with conjugates of anti-hDectin-1 and MART-1 peptide26–35 (27L) can cross-prime MART-1–specific CD8+ T cells. A, Purified naive CD8+ T cells were cocultured with IFNDCs loaded with conjugates (as indicated) for 10 d in the presence of IL-2 (20 U/ml). Cells from four wells in each group were combined into one well before staining with anti-CD8 Ab and tetramer. B, Data from experiments using cells from 10 healthy donors are presented. C, CD8+ T cells were stained with tetramer, anti-granzyme B, and anti-perforin Abs. D, Data from four independent experiments using cells from four healthy donors are presented. E, A 5-h 51Cr release assay was performed using T2 cells loaded with 10 μM MART-1 peptide26–35. Error bars are SD of triplicate assays in two independent experiments. F, A 5-h 51Cr release assay using a melanoma cell line (Mel290) and a control cell line (K562). Error bars indicate SD of triplicates. All cells tested in Fig. 6 were from HLA-A*0201+ healthy donors. 7-AAD+ cells were gated out in A and B. The p values were calculated by Student t test. CD8+ T cells induced by targeting Ags to DCs via hDectin-1 were stained with tetramer, anti-granzyme B, and anti-perforin Abs. Fig. 6C shows that anti–hDectin-1-MART-126–35 (27L) conjugates resulted in a higher percentage of tetramer+granzyme B+ CD8+ T cells (1.7%) than IgG4-MART-126–35 (27L) conjugates (0.05%). Anti–hDectin-1 conjugates also induced a higher percentage of tetramer+perforin+CD8+ T cells (2.9%) than IgG4 conjugates (0.5%). Fig. 6D summarizes the data from four independent experiments. 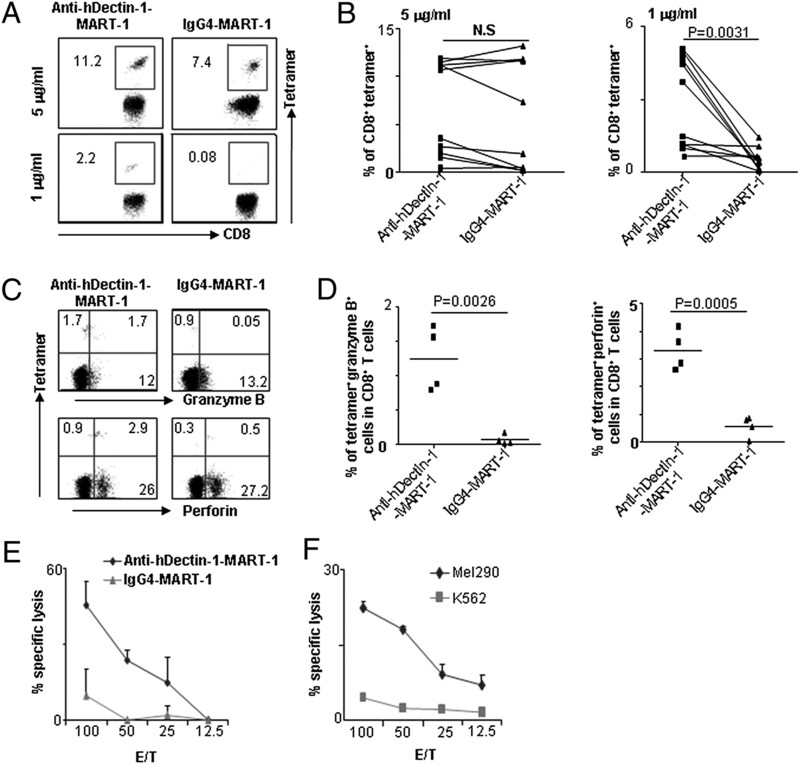 Consistent with the increased frequency of MART-1–specific CD8+ T cells and the percentages of granzyme B+CD8+ T cells, CD8+ T cells induced with anti–hDectin-1 conjugates, unlike CD8+ T cells induced with IgG4 conjugates, efficiently killed MART-1 peptide-loaded target cells (Fig. 6E). Fig. 6F further demonstrates that the MART-1–specific CD8+ T cells induced with anti–hDectin-1 conjugates killed MART-1–expressing tumor cells, Mel 290, but not the control cell line, K562. CD8+ CTL induced by control IgG4 conjugates did not kill Mel290 (data not shown). Taken together, our data demonstrate that anti–hDectin-1 conjugates target hDectin-1 expressed on DCs, resulting in potent Ag-specific CD8+ T cell responses. Moreover, those CD8+ T cells induced with anti–hDectin-1 conjugates were functional. In consideration of the actual amount of Ags delivered to DCs (<10 ng MART-126–35 (27L) in 1 μg anti–hDectin-1 conjugates), targeting Ags to DCs via hDectin-1 is an efficient way to cross-prime Ag-specific CD8+ T cells. Conjugates of anti–hDectin-1 and Flu M1 protein were made, as described for MART-1 peptide26–35 (27L) conjugates. Fig. 7A shows that IFNDCs loaded with three different concentrations (0.5, 1, and 10 μg/ml) of anti–hDectin-1-Flu M1 conjugates resulted in significant levels of Flu M1-specific CD8+ T cell responses, as measured by staining cells with anti-CD8 and HLA-A*0201-Flu M158–66 peptide tetramer. In contrast, IFNDCs loaded with the same concentrations of control IgG4-Flu M1 conjugates resulted in lower levels of Flu M158–66 peptide-specific CD8+ T cell responses. This was particularly evident when IFNDCs were loaded with the low concentration (0.5 μg/ml) of IgG4-Flu M1 conjugates. This demonstrates that anti–hDectin-1-Flu M1 can target DCs via hDectin-1, resulting in potent Flu M1-specific CD8+ T cell responses. Fig. 7B summarizes the data from four independent experiments. Conjugates of anti–hDectin-1-Flu M1 protein can elicit potent Flu M1-specific CD8+ T cell responses. A, IFNDCs were loaded with different concentrations of conjugates, as indicated. Purified autologous CD8+ T cells were cocultured for 8 d in the presence of IL-2 (20 U/ml). Cells were stained with anti-CD8 mAb and tetramer. 7-AAD+ cells were gated out. B, Data from four separate experiments using cells from HLA-A*0201+ healthy donors are summarized (10 μg/ml, p = 0.0372; 1 μg/ml, p = 0.0423; 0.5 μg/ml, p = 0.0155). Error bars indicate SD from four separate experiments. C, CD8+ T cells expanded with 1 μg/ml conjugates were stained with tetramer, anti-granzyme B, and anti-perforin Abs. D, Data from three independent experiments using cells from three healthy donors are summarized. The p values were calculated by Student t test. E, Five-hour 51Cr release assays were performed using T2 cells loaded with different concentrations of Flu M158–66 peptide. All cells tested in Fig. 7 were from HLA-A*0201+ healthy donors. To further characterize the CD8+ T cells expanded by targeting Flu M1 to DCs via Dectin-1, CD8+ T cells expanded with 1 μg/ml conjugates (actual amount of Flu M1: <100 ng) were stained with tetramer, anti-granzyme B, and anti-perforin Abs (Fig. 7C). Anti–hDectin-1-Flu M1 resulted in a higher frequency of tetramer+granzyme B+ CD8+ T cells (3%) than IgG4-Flu M1 (1.3%). Anti–hDectin-1 conjugates also resulted in a higher frequency of tetramer+perforin+ CD8+ T cells (4.4%) than IgG4 conjugates (2.1%). Fig. 7D summarizes the data from three independent experiments. Fig. 7E shows that Flu M158–66 peptide-specific CD8+ T cells expanded with either anti–hDectin-1-Flu M1 or IgG4-Flu M1 conjugates could kill 10 nM Flu M158–66 peptide-loaded target cells. However, only CD8+ T cells activated with anti–hDectin-1-Flu M1, but not with IgG4-Flu M1 conjugates, efficiently killed 1 nM peptide-loaded target cells. This suggests that CD8+ T cells activated with anti–hDectin-1 conjugates have higher functional avidity than those activated by IgG4 conjugates. Taken together, our data demonstrate that IFNDCs capture Ags via hDectin-1 and that they can efficiently cross-present antigenic peptides to elicit functionally active Ag-specific CD8+ T cell responses. Generation of an agonistic anti–hDectin-1 mAb allowed us to test the intrinsic capacity of hDectin-1 expressed on DCs to induce and activate Ag-specific CD8+ T cell responses. We first characterized the biochemical and immunological functions of the agonistic anti–hDectin-1 mAb and then further demonstrated that concomitant activation and Ag uptake via hDectin-1 could elicit potent Ag-specific CD8+ T cell responses. Anti–hDectin-1 mAb (15E2) bound to both in vitro and in vivo DCs. It recognized the lectin domain of hDectin-1 (Glu143-Ile162 region), which is different from the binding site of β-glucans or that of the previously known mAb 4B2 (36, 40). Anti–Dectin-1 (4B2) does not activate APCs or inhibit β-glucan binding to Dectin-1 (36, 40). β-glucans did not inhibit the binding of anti–hDectin-1 mAb (15E2) to hDectin-1 either, suggesting that the pep19/20147–157 region within the lectin domain does not directly contribute to the T cells of polymeric β-glucans to hDectin-1 (35, 36). As previously reported (41, 42), monocytes, blood mDCs, and B cells expressed significant levels of hDectin-1. Considering the functional specialty of DC subsets in eliciting different qualities of host immune responses (38, 43–46), the expression levels of hDectin-1 on skin DC subsets. A previous study performed by immunohistochemistry of mouse skin sections (22) showed that Dectin-1 was expressed on mouse dermal DCs but not LCs. In contrast, another study (47) showed that epidermal CD1a+ cells in human skin expressed Dectin-1. However, our data demonstrated that CD1a+ cells in the dermis, but not the epidermis, express significant levels of hDectin-1. Furthermore, CD207+ LCs in the epidermis of healthy human skin did not express significant levels of hDectin-1. The majority of hDectin-1–expressing cells were dermal CD1c+, consistent with the data observed in mouse skin (22). Anti–hDectin-1 mAb (15E2) activated DCs in a Syk-dependent manner. Both IL-4DCs and IFNDCs stimulated with anti–hDectin-1 mAb upregulated surface expression levels of costimulatory molecules and HLA-DR. Interestingly, only IFNDCs upregulated CD137L expression when they were stimulated with anti–hDectin-1 mAb. Although E. coli LPS and curdlan induced DCs to secrete higher levels of cytokines and chemokines than anti–hDectin-1 mAb, both IL-4DCs and IFNDCs expressed similar levels of costimulatory molecules and HLA-DR when they were stimulated with these three agents. In addition to IL-6, IL-10, IL-12p40, and MCP-1, anti–hDectin-1 mAb induced human monocyte-derived DCs to secrete significant amounts of TNF-α. This is also seen in DCs stimulated with β-glucans (48). Cross-talk between different classes of pattern recognition receptors is a major component of signal integration for eliciting immune responses (49). Interactions of Dectin-1 with TLR2 were tested in murine models (3). In addition, synergistic effects of Dectin-1 and TLR4 were demonstrated in human primary monocytes and macrophages (50). Consistently, hDectin-1 expressed on DCs cooperates with TLR4 to activate DCs. However, the results of IL-4DC activation by the combinations of anti–hDectin-1 mAb and LPS were not the same as those of IFNDC activation by the same combinations, suggesting that these signaling pathways are integrated differently in these two DC subtypes. For example, the combination of anti–hDectin-1 mAb and LPS induced IL-4DCs to secrete increased levels of IL-1β, IL-10, IL-12p40, and TNF-α. However, the same combination activated IFNDCs to secrete increased amounts of IL-6 and TNF-α. One of the major outcomes of DC activation by anti–hDectin-1 mAb was the enhancement of Ag-specific CD8+ T cell responses. IFNDCs activated with anti–hDectin-1 mAb (15E2) resulted in enhanced Ag-specific naive and memory CD8+ T cell responses. This enhancement was due to both increased expansion of Ag-specific CD8+ T cells and increased functional activity of Ag-specific CD8+ T cells. This is consistent with the increased expression of granzyme B in CD8+ T cells that are induced with anti–hDectin-1-activated DCs. In addition, our data (Fig. 7E) demonstrated that anti–hDectin-1 conjugates elicit high-avidity CD8+ T cells. Functional avidity of effector CD8+ T cells is one of the major factors that could determine the efficacy of vaccines against cancers and infections (51, 52). A previous study has shown that mice immunized with conjugates of anti–Dectin-1 and OVA generated strong CD4+ T cell responses but weak CD8+ T cell responses (22). In contrast, another study showed that mouse DCs activated with β-glucans resulted in CD8+ T cell priming (30). Data from those two studies suggested that Ags delivered to DCs via hDectin-1 could efficiently induce and activate Ag-specific CD8+ T cell responses when the DCs are properly activated. In this study, we demonstrated that delivering Ags to IFNDCs via hDectin-1 with concomitant activation of DCs could efficiently induce and activate functionally active Ag-specific CD8+ T cells. The immense potential of DC-targeting vaccines has been well described (53). Our data suggest that the agonistic anti–hDectin-1 mAb tested in this study could be useful for generating future human vaccines. The combination of anti–hDectin-1 and TLR agonists further enhanced the activation of DCs, but it did not result in enhanced Ag-specific CD8+ T cell responses (data not shown). Blocking IL-10 with anti–IL-10 and anti–IL-10R Abs did not enhance anti–hDectin-1–mediated MART-1–specific CD8+ T cell responses (data not shown), in agreement with a previous study (54). Considering the potential roles of Dectin-1–mediated signaling in the expansion of Th17 cells (3, 14, 21, 22, 48, 55) and the beneficial roles of Th17 cells in cellular immunity (27, 56–63), CD8+ T cell responses elicited by DCs activated with combinations of anti–hDectin-1 and TLR agonists need to be further tested in the context of Ag-specific CD4+ T cell responses. Recent studies have shown that Th17 CD4+ T cells play significant roles in mounting CD8+ T cell-mediated immunity (27, 56–63). In conclusion, this study demonstrates that Dectin-1 expressed on human DCs possesses a potent capacity for enhancing Ag-specific CD8+ T cell responses. Data from this study will help us not only to understand the mechanisms of host immune defense against fungal and mycobacterial infections but also to design new vaccine strategies against those infections. We thank Elizabeth Kowalski and Sebastien Coquery in the FACS Core, Lynnette Walters in the Cell Processing Core, and Cindy Samuelsen in Administration Office at the Baylor Institute for Immunology Research. We thank Drs. Carson Harrod (Baylor Institute for Immunology Research) and Maryna Eichelberger (U.S. Food and Drug Administration) for critical reading of this manuscript. We also thank Dr. Michael Ramsay for supporting this study. This work was supported by National Institutes of Health Grants U19 AI057234 and R01 CA078846 and the Baylor Health Care System Foundation. J.B. holds the W.W. Caruth, Jr., Chair for Transplantation Immunology Research.
. 2001. Sensing pathogens and tuning immune responses. Science 293: 253–256.
. 2006. Innate immune recognition of viral infection. Nat. Immunol. 7: 131–137. 2006. Dectin-1: a signalling non-TLR pattern-recognition receptor. Nat. Rev. Immunol. 6: 33–43.
. 2007. Innate signaling and regulation of dendritic cell immunity. Curr. Opin. Immunol. 19: 435–440.
. 2006. Targeting antigens to dendritic cells in vivo. Immunobiology 211: 599–608.
. 2002. The β-glucan receptor, dectin-1, is predominantly expressed on the surface of cells of the monocyte/macrophage and neutrophil lineages. J. Immunol. 169: 3876–3882.
. 2007. Dectin-1 is required for β-glucan recognition and control of fungal infection. Nat. Immunol. 8: 31–38.
. 2007. Dectin-1 interaction with Mycobacterium tuberculosis leads to enhanced IL-12p40 production by splenic dendritic cells. J. Immunol. 179: 3463–3471.
. 2004. Dectin-1 uses novel mechanisms for yeast phagocytosis in macrophages. Blood 104: 4038–4045.
. 2005. Syk-dependent cytokine induction by Dectin-1 reveals a novel pattern recognition pathway for C type lectins. Immunity 22: 507–517.
. 2006. Card9 controls a non-TLR signalling pathway for innate anti-fungal immunity. Nature 442: 651–656.
. 2007. Syk- and CARD9-dependent coupling of innate immunity to the induction of T helper cells that produce interleukin 17. Nat. Immunol. 8: 630–638.
. 2007. The adaptor protein CARD9 is essential for the activation of myeloid cells through ITAM-associated and Toll-like receptors. Nat. Immunol. 8: 619–629.
. 2009. Differential use of CARD9 by dectin-1 in macrophages and dendritic cells. J. Immunol. 182: 1146–1154.
. 2007. Dectin-1 stimulation by Candida albicans yeast or zymosan triggers NFAT activation in macrophages and dendritic cells. J. Immunol. 178: 3107–3115.
. 2006. Yeast zymosan, a stimulus for TLR2 and dectin-1, induces regulatory antigen-presenting cells and immunological tolerance. J. Clin. Invest. 116: 916–928.
. 2008. Syk kinase is required for collaborative cytokine production induced through Dectin-1 and Toll-like receptors. Eur. J. Immunol. 38: 500–506.
. 2007. Syk-dependent ERK activation regulates IL-2 and IL-10 production by DC stimulated with zymosan. Eur. J. Immunol. 37: 1600–1612.
. 2008. hDectin-1 is involved in uptake and cross-presentation of cellular antigens. Blood 111: 4264–4272.
. 2007. Interleukins 1β and 6 but not transforming growth factor-β are essential for the differentiation of interleukin 17-producing human T helper cells. Nat. Immunol. 8: 942–949.
. 2009. Interleukin-17 is required for T helper 1 cell immunity and host resistance to the intracellular pathogen Francisella tularensis. Immunity 31: 799–810.
. 2000. Identification of a novel, dendritic cell-associated molecule, dectin-1, by subtractive cDNA cloning. J. Biol. Chem. 275: 20157–20167.
. 2002. The dendritic cell-specific adhesion receptor DC-SIGN internalizes antigen for presentation to T cells. J. Immunol. 168: 2118–2126.
. 2008. Stimulation of dendritic cells via the dectin-1/Syk pathway allows priming of cytotoxic T-cell responses. Blood 112: 4971–4980.
. 1999. APCs express DCIR, a novel C-type lectin surface receptor containing an immunoreceptor tyrosine-based inhibitory motif. J. Immunol. 163: 1973–1983.
. 2001. 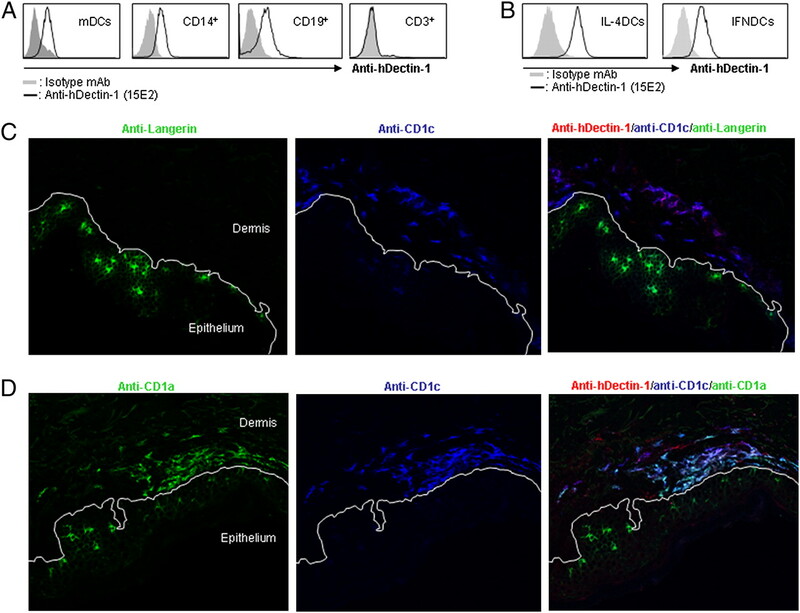 Induction of dendritic cell differentiation by IFN-α in systemic lupus erythematosus. Science 294: 1540–1543.
. 2004. Human CTLs to wild-type and enhanced epitopes of a novel prostate and breast tumor-associated protein, TARP, lyse human breast cancer cells. Cancer Res. 64: 2610–2618.
. 2000. Elimination of Fc receptor-dependent effector functions of a modified IgG4 monoclonal antibody to human CD4. J. Immunol. 164: 1925–1933.
. 2007. Structure of the fungal β-glucan-binding immune receptor dectin-1: implications for function. Protein Sci. 16: 1042–1052.
. 2004. Characterization of β-glucan recognition site on C-type lectin, dectin 1. Infect. Immun. 72: 4159–4171. 2005. TNF/TNFR family members in costimulation of T cell responses. Annu. Rev. Immunol. 23: 23–68.
. 2008. Functional specializations of human epidermal Langerhans cells and CD14+ dermal dendritic cells. Immunity 29: 497–510.
. 2003. Cellulosome assembly revealed by the crystal structure of the cohesin-dockerin complex. Proc. Natl. Acad. Sci. USA 100: 13809–13814.
. 2004. Identification and characterization of a novel human myeloid inhibitory C-type lectin-like receptor (MICL) that is predominantly expressed on granulocytes and monocytes. J. Biol. Chem. 279: 14792–14802.
. 2008. Targeting DCIR on human plasmacytoid dendritic cells results in antigen presentation and inhibits IFN-α production. Blood 111: 4245–4253.
. 1996. CD34+ hematopoietic progenitors from human cord blood differentiate along two independent dendritic cell pathways in response to GM-CSF+TNF α. J. Exp. Med. 184: 695–706.
. 1999. CD8α+ and CD8α− subclasses of dendritic cells direct the development of distinct T helper cells in vivo. J. Exp. Med. 189: 587–592.
. 1999. Distinct dendritic cell subsets differentially regulate the class of immune response in vivo. Proc. Natl. Acad. Sci. USA 96: 1036–1041.
. 2007. 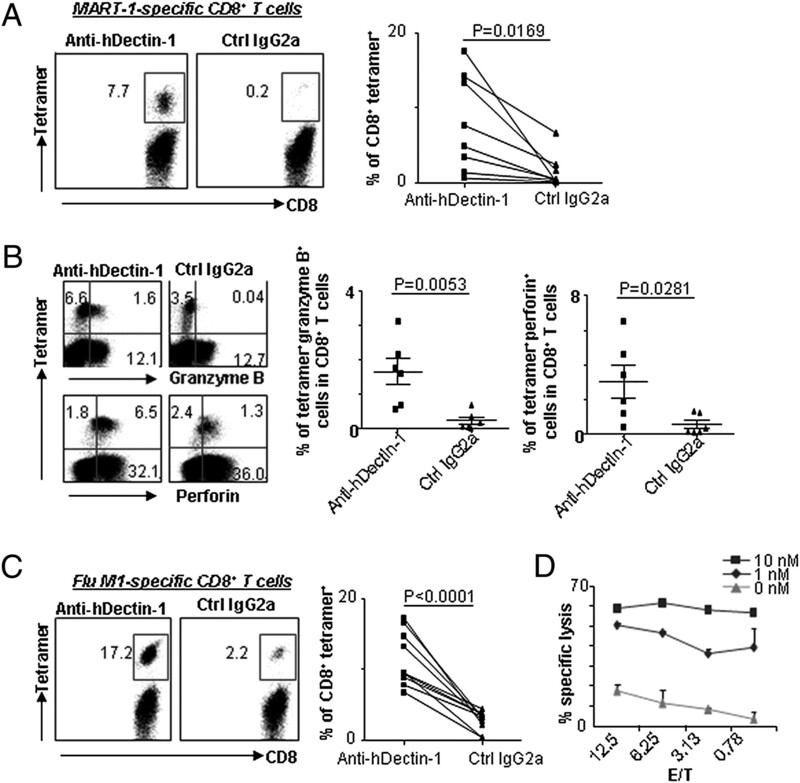 A subset of dendritic cells induces CD4+ T cells to produce IFN-γ by an IL-12–independent but CD70-dependent mechanism in vivo. J. Exp. Med. 204: 1095–1106.
. 2001. Identification of a human homologue of the dendritic cell-associated C-type lectin-1, dectin-1. Gene 272: 51–60.
. 2006. Pneumocystis cell wall β-glucans induce dendritic cell costimulatory molecule expression and inflammatory activation through a Fas-Fas ligand mechanism. J. Immunol. 177: 459–467. 2007. Collaboration between the innate immune receptors dectin-1, TLRs, and Nods. Immunol. Rev. 219: 75–87.
. 2008. Dectin-1 synergizes with TLR2 and TLR4 for cytokine production in human primary monocytes and macrophages. Cell. Microbiol. 10: 2058–2066.
. 1996. Role of antigen, CD8, and cytotoxic T lymphocyte (CTL) avidity in high dose antigen induction of apoptosis of effector CTL. J. Exp. Med. 184: 485–492.
. 2003. Selective induction of high avidity CTL by altering the balance of signals from APC. J. Immunol. 170: 2523–2530. 2008. Dendritic cells in vivo: a key target for a new vaccine science. Immunity 29: 319–324.
. 1995. In vitro priming of tumor-reactive cytolytic T lymphocytes by combining IL-10 with B7-CD28 costimulation. J. Immunol. 155: 3897–3903.
. 2005. A role for fungal β-glucans and their receptor Dectin-1 in the induction of autoimmune arthritis in genetically susceptible mice. J. Exp. Med. 201: 949–960.
. 2006. Mycobacterium tuberculosis-specific CD8+ T cells and their role in immunity. Crit. Rev. Immunol. 26: 317–352.
. 2002. CD8+ T cells in tuberculosis. Am. J. Respir. Crit. Care Med. 166: 1116–1121.
. 2009. Th1 and Th17 hypercytokinemia as early host response signature in severe pandemic influenza. Crit. Care 13: R201.
. 2009. TLR2 engagement on dendritic cells promotes high frequency effector and memory CD4 T cell responses. J. Immunol. 183: 7832–7841.
. 2009. T helper 17 cells promote cytotoxic T cell activation in tumor immunity. Immunity 31: 787–798.